The dominant feature on Monday will be a transforming upper trough / low over E Atlantic / W Europe. Strong WAA will be advecting unstable airmass northwards across Iberia and W France. 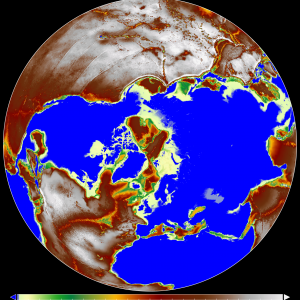 A short-wave trough moves across N Africa towards east. 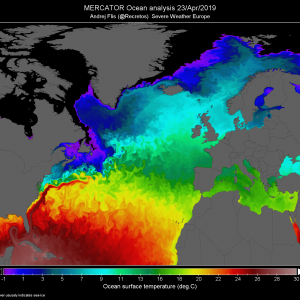 Further east, an extensive ridge lies over NW Russia where a stalled frontal boundary serves as a focus for another round of explosive severe storms across ENE Europe. 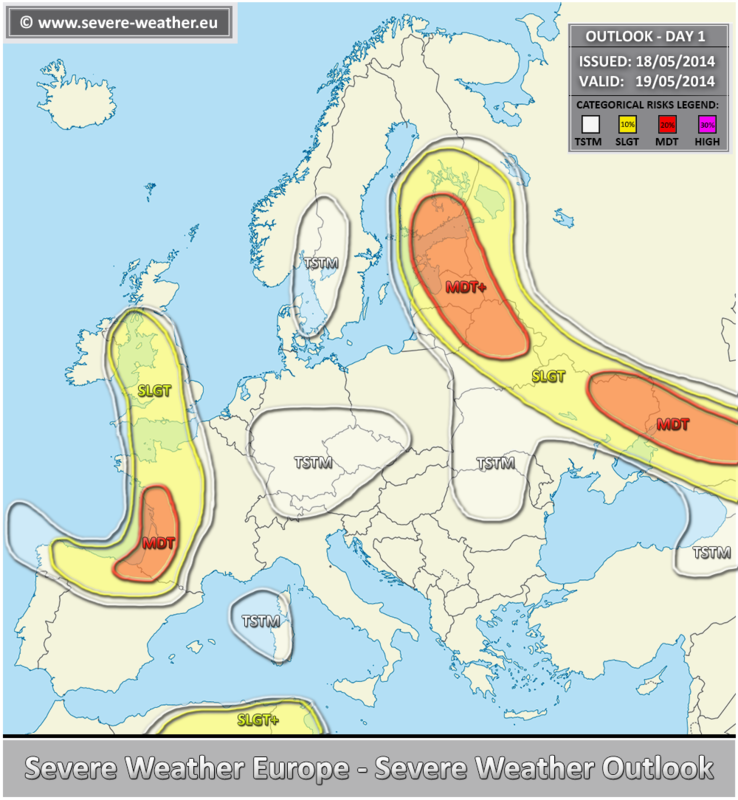 A MDT+ risk has been issued for N Belarus across Baltic States, extreme NW Russia and extreme S Finland with threat for large to very large hail, severe winds, torrential rain and tornadoes. Again, outbreak of severe storms appears likely given the moderate shear and strong to extreme instability in place. Storms will tend to cluster into one or two larger convective systems later in the evening when activity spreading onto Estonia and S Finland. A MDT risk has been issued for E Ukraine into SW Russia with threat for tornadoes large large hail, severe winds and torrential rain. Very favorable LL wind profiles will provide strongly sheared and helical environment for rotating storms, including tornadoes where some of them could be strong (SR 1km helicity in excess of 200 m^2/s^2). A SLGT risk has been issued for areas surrounding the MDT risks across E Europe / NW Russia and extended further SE along the frontal boundary across E Ukraine into SW Russia. Here, more isolated but still organized severe storms are expected. Supercells with large hail, strong to severe winds and some tornado threat are well possible. 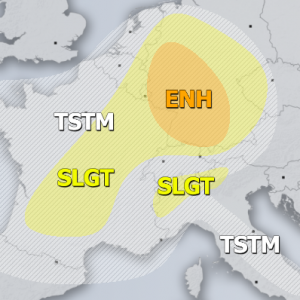 A MDT risk has been issued for parts of extreme N Iberia into SW France with threat for large hail, severe winds, torrential rain and tornadoes. A widespread severe storms are well possible by mid mid-afternoon onwards. Tornado threat seems maximized towards the evening when LL shear and helicity will be greatly enhanced. 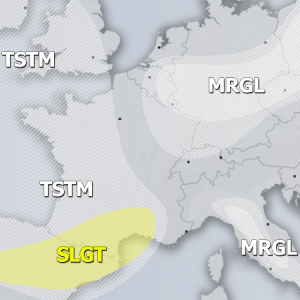 A SLGT risk has been issued for surrounding areas of MDT risk over N Iberia, W France and into the UK with threat for heavy rain, severe winds, marginally large hail and tornadoes. A SLGT+ risk has been issued for NE Algeria into N Tunisia with threat for very large hail, severe winds and torrential rain with flash floods threat. Isolated supercells are likely in moderate sheared and strongly sheared environment by mid afternoon onwards. Lightning areas were placed where diurnal driver storms are likely in weakly capped unstable but weakly sheared environment. Some marginal hail or heavy rain threat exists.